This year Raksha Bandhan snuck up on me! August 2nd is just 2 weeks away! Raksha Bandhan is the Hindu celebration of the bond between brother and sisters. It also happens to be my favorite holiday-- especially now that I have a son and daughter. For me, the focus last year's Raksha Bandhan tryking to keep both kids were awake for the ceremony. This year, I'm really looking for ways to make the holiday more memorable for both kids and adults. The first thing I thought of were DIY Rakhi's. I make them every year but this time I wanted to involve Amaani. Nowadays, Rakhis are easily and cheaply bought where I live. Even still making your own Rakhi's is a great opportunity to talk with your kids about the meaning of the holiday. These Rakhis are made of cotton embroidery floss, making them color fast, sturdy and – most importantly for the littlest ones- comfortable to wear. Children will want to wear them for longer as you can make them in any color they want and they don't have flowers or beads. 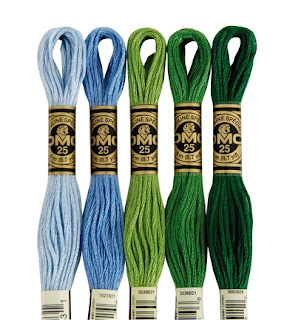 Embroidery Floss: Embroidery floss comes in hundreds of colors and is easy to find at any craft store or even Walmart. See if you can find out the recipients favorite colors or school colors and match them! Each bundle of thread is about a quarter, so this is a very inexpensive project. Scissors— be careful to keep these out of reach of your little ones. Even safety scissors will work for this project. Since there isn't any braiding, this method for making Rakhi's is great for involving even the littlest ones. First, get your 'assistant' in from the yard. Cut a 24 inch length of floss from 3 different colors. Combine and knot the strings so they are easier to hold. Hold one end of the strings, and have your helper hold the other. If you don’t have a (reliable) helper, you can tape the ends down to a table or counter to allow you to hold them taut. Then twist! Either you or your helper rotate the strings. You can see the colors getting closer and closer together. Then, bring both ends together and watch the magic happen! The cord will twist on itself. Use your hands to gently smooth out the kinks. I like to knot both ends and trim them so they are even with each other. You can use any number of colors for this-- as long as you have at least two strands of floss. Although the bright colors in the rakhi above are pretty, I love the look of monochrome rakhis. This one is in different shades of blue. And of course, the traditional red. This one is made with two slightly different shades of red to give it a bit more depth. And I had to make one for my daughter as well-- in pink! Both kids were asking to wear these by the time I was finished taking the pictures! I hope that you give making your own rakhi a try! If this tutorial is helpful or if you have questions- consider leaving a comment below. I'd love to hear from you! I'm so glad that you liked it! thanks for linking up! So do you just tie it on like a friendship bracelet? Yup, right around the wrist. Traditionally, a rakhi only goes on the right hand wrist. I'll update this post a link to pictures our our ceremony when it goes up on Friday!